Kazakhstan, officially the Republic of Kazakhstan, is a former Soviet Union's republic, now independent and sovereign country. It is situated in Central Asia and is ranked as the ninth largest country in the world. Kazakhstan has a territory of 2,727,300 km² (greater than Western Europe). It is bordered by Russia, Kyrgyzstan, Turkmenistan, Uzbekistan and China. The country is rich in natural resources such as oil and gas, uranium, gold, metals and is also a major producer of grain. 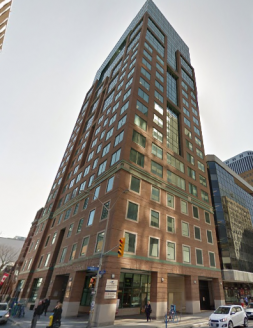 Embassy of Kazakhstan in Canada is located in downtown Ottawa in an office building shown on the picture to the left. Kazakh Service Centre is a visa and document services agency that works exclusively with Kazakhstan embassies and consulates abroad. Occasionally, when needed for Kazakhstan former and current citizens, we can also provide similar services at other foreign embassies and consulates located in Ottawa, Toronto, Montreal, Calgary and Vancouver. It was created in 2009. In Canada Kazakh Service Centre works on a daily basis with Embassy of Kazakhstan in Ottawa and Consulate of Kazakhstan in Toronto. Kazakh Service Centre in Canada used to have several representatives at various territorially-divided locations across Canada. In 2012 we consolidated our service support operations to Ottawa only for centralized customer-oriented focus. Now our clients from all over Canada can send their visa applications and documents for authentication/legalization to a single location in downtown Ottawa within minutes from the Kazakhstan Embassy and get a more efficient customer service. We strive to provide high-quality services to organizations, companies and private individuals in Canada on Kazakhstan visas and other consular services for private and corporate documents (e.g., legalization of documents). We also provide services to Kazakhstan citizens in Canada and companies that do business with Canada. Kazakh Service Centre can save you time hassle-free by undertaking all obligations from initial document review, assistance in preparation of documents until full completion. As part of this initiative, we have standardized and improved Application Packages for both visa and legalization services. These Application Packages now contain detailed Checklists to ensure smooth processing of documents at Embassy of Kazakhstan in Canada.